This book is in good condition except that the front cover is detached and chipped and is listed as the high end of scarce in collecting guides. The pages are tan to off white colored and supple slight edge wear and age staining as expected with a book that is 120 years old. (See scan for further details.) If you have a particular issues or newspapers you need for your collection drop us a message through Ebay or at our website imaginationradio com. Printed and Published by Frank Tousey. This series was initially a high-seller, but it soon came under fire for ‘improper’ stories. In 1884 Anthony Comstock charged Tousey for printing G. W. M. Reynolds’ "The Mysteries of the Court of London" in The Brookside Library, a story deemed a vice. Frank Tousey’s uncle, Sinclair Tousey, provided him with bail and the nephew’s legal adviser, W. H. Townley, claimed that Comstock’s accusation was a personal vendetta against Tousey for caricatures made of the former in The Judge under Tousey’s ownership. Following review in the Tombs, Tousey was required to destroy the plates in order to avoid further prosecution. The Brookside Library was published weekly by Frank Tousey based in New York, USA. It ran from 1882 to 1884 for a total of 410 issues. I am not a grader so I make sure the scans are close and as detailed as I can make them. We have many other we have or will be listing if you have any questions just e-mail me through EBAY or at our web site imaginationradio com . This is one of 800 "Beadle's Dime Library, Nick Carter Library, Old Sleuth Library, &"The Shadow Magazines" as well as several thousand dime novels we will be placing on EBAY and in our site store over this year. Any questions or special requests please email us. We always try to list any items that are requested as quickly if we can. 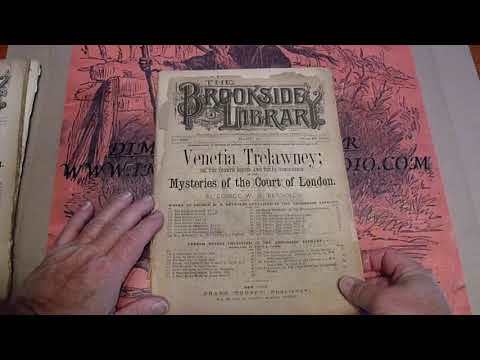 Click the button below to add the VERY SCARCE BROOKSIDE LIBRARY #316 FRANK TOUSEY DIME NOVEL STORY PAPER to your wish list.